One of the most celebrated festivals in Camiguin is the Camiguin Lanzones Festival which commemorates the annual harvesting of lanzones in this island province of the Philippines located in Bohol Sea just off the northern coast of Mindanao. Lanzones Festival is an annual celebration in October. It is weekend of fun including street dancing, numerous beauty pageants and a parade celebrated in Mambajao town. 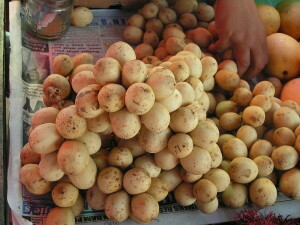 The lanzones fruit ripens sometime during the third week of October. The Camiguin Lanzones Festival is also the time when agri-cottage industry products, town beautification, the local culture and some indigenous sports are showcased and form part of the splendid parade of lanzones. Lanzones grown in Camiguin are golden in texture and considered the sweetest lanzones with its light brown skin and sweet translucent flesh. The beauty contest is held at the ABC gymnasium in its capital of Mambajao. The street dancing contest is held in the morning while the final event is the Disco sa Kalye held in the Mambajao Public Market. Other festivals in Camiguin are the May festivals which is a month-long celebration of feasts or “fiestas” in each barangay and town in Camiguin Island. These fiestas are highlighted by the Santacruzan and the search for the Rose of May, a beauty contest. The San Juan Hibok-hibokan is a festival celebrated in the entire province every June 24 in honor of St. John Baptist. The Hibok-hibokan festival encourages the people to go to the nearest beach usually in Cabua-an and Agohay beaches and perform some watersports such as boat races and aqua palo sebo before taking part of a fluvial procession. A Miss Hibok-hibokan which is another beauty contest also forms part of this festival. Panaad is considered a non-merrymaking festival but an activity celebrated during Holy Thursday and Good Friday. People from different walks of life in Camiguin and those from nearby provinces tread the circumferential road of Camiguin before climbing Mt. Vulcan where the 14 stations of crucifixion of Jesus Christ are depicted. For more information about Camiguin, you can go to its website www.camiguin.gov.ph for tourist support services. You can also contact the following agencies for any issue or information about your travel.